Alexander M. Kadakin, Russia’s Ambassador to India. Russian Cultural Centres across India are marking important anniversaries. While Trivandrum and Mumbai recently turned 40, the Russian Centre for Science and Culture in the Indian capital just celebrated its golden jubilee. 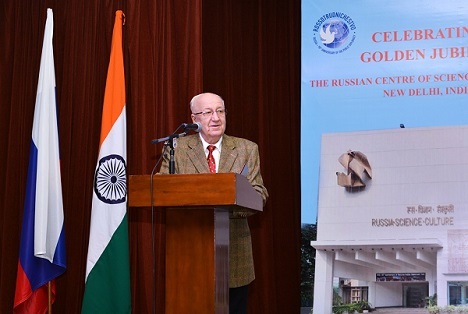 A colourful function marked the Golden Jubilee celebrations of the New Delhi branch of the Russian Centre of Science and Culture (RCSC) on December 15. Held at the RCSC building, the celebrations coincided with the 90th Anniversary of Russian Public Diplomacy. A special Postal Cover and Stamp, dedicated to the 50th anniversary of the RCSC was released by Vasu Mitra, chief Postmaster General, Delhi Circle, and presented to chief guest Prof Lokesh Chandra, President, Indian Council for Cultural Relations (ICCR), H.E Alexander M. Kadakin, Russia’s Ambassador to India, and Fedor Rozovskiy, Director, RCSC. A special booklet, dedicated to the 50th Anniversary of the RCSC, was released by Prof Chandra. The official part of the function was followed by a Classical and Folk Ballet Show by the Moscow State Academic Theatre of Dance “Gzhel”. An exhibition of photographs, depicting major activities of the RCSC over 50 years was also on display for the occasion. A large gathering comprising a cross-section of Delhi’s social elite, including the Ambassadors of Armenia, Bulgaria, Kyrgyz Republic, members of the diplomatic corps from other embassies, army personnel, educationists, Russian compatriots, students, media persons, attended the function. Speaking on the occasion, Prof Chandra lauded the RCSC’s multifarious activities over five decades, which have greatly contributed to strengthening Indo-Russian relations and promoting people-to-people diplomacy. He described the institution as a symbolic edifice reflecting Indo-Russian friendship and cooperation. Citing ancient cultural and traditional links between India and Russia, he underlined the spiritual legacy left by the Roerichs family, inspired by the Himalayas, and said Nicholas Roerich has been recognised as the first cultural ambassador of Russia to India. Ambassador Kadakin emphasised that the RCSC has been the conduit and repository of cultural dialogue and people-to-people interaction between the two nations. He appreciated the holding of the Art Exhibition “Russian Winter”, the Art Exhibition and the release of the unique book “Prince Alexei Saltykov’s Journey across India” published by the Russian Embassy, and others, as credible achievements of the Centre. Referring to the forthcoming visit to Russia by Prime Minister Narendra Modi on December 23-24, the Ambassador was confident that the Russian-Indian Summit in Moscow would give a new impetus to the expansion of a multi-faceted, mutually-beneficial partnership between the two countries. In his vote of thanks, Rozovskiy said the golden jubilee was a “magnificent day in the life or our two nations and peoples”, and a momentous milestone.